I'll tell you my dirty little secret. I have never been to a San Francisco Giants home game. I've never even been to San Francisco. It's strange to grow up in a different city than your favorite team. I root for the Bears, Bulls, and Blackhawks, so I know what it's like to have a hometown team. I'm not some front running jackass from my generation whose 4 favorite sports teams are the Yankees, Cowboys, Lakers, and Red Wings (or Penguins). I didn't choose my team because they were what's cool, it was bestowed upon me. So there I was, a Giants fan growing up in a sea of Cubs fans. For one thing I did feel lucky to have two Major League teams in my city. 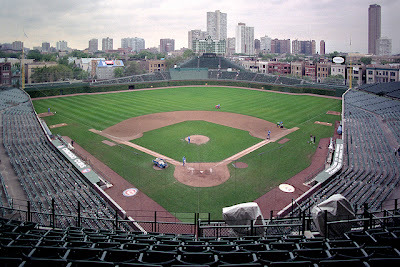 I grew up going to both Wrigley and Comiskey. I really consider Wrigley Field my home park. I spent my teen and early 20's years going to that ballpark. That picture at the top is exactly how I remember Wrigley. I was always the black hat among the blue ones. Even back in grade school. But back then I didn't know if the Giants had won or lost before I went to bed. I would wake up in the morning, rush to the end of the driveway and get the paper. Then, if I was lucky, I would stare at the Giants boxscore from the previous night. There were many early mornings I was not so lucky. The term "late games not included" was very familiar to a young Eric. That was just how I got the information. If the Giants weren't in the playoffs, seeing them on TV was always difficult. This was back when there was one game on Saturday afternoons for me. I didn't have cable and the Cubs dominated my television. Thank goodness for Wrigley Field though. That has always been the backdrop for live Giants baseball. I have never seen them in home whites. It's always the gray with the ivy in the background. I would see the Giants in person at least once a year growing up. A lot of the things I remember about the Giants of the late 80's and early 90's I read in the paper. It's how I had to paint the story for myself. There was no Internet. No twitter updating about the game all the time. No MLB.tv to watch the Giants in the comfort of home 2,000 miles away. There was listening to news radio sports updates at :15 and :45 past the hour late in to the night hoping they mention the final from out West. I always stood out. It's fun at times, mostly when the Giants were winning, but others it just sucked. I have had every bad name in the world shouted at me for wearing my Giants gear. When I was 12. I had quarters thrown at me during a game one year. Ended up with free beer there. Because I loved the Giants so much, Cubs fan friends started to hate them. It all came from friendly competition, but it yet again singled out my fandom. When the Giants lost in 2002 to the Angels, everyone I watched the game with was happy. That was a kick in the teeth. I don't know what it is like to watch a Giants game with a group of Giants fans. I've watched with my Dad. I watch with roommates. But it's not one big collective. I don't know what it feels like to have thousands of Giants fans cheering at the same time. All I know is cheering against the grain. And I've gotten used to it. Things have changed though. They have drastically changed. I don't have to wait until the next morning for the score. I watch the games now. The Internet is a great thing. If I miss the game, I can watch it later. The group of Giants fans I never got to watch a game with? That's changed too. Twitter has opened up a whole new world. I get to laugh, cry, scream, and debate with fellow Giants fans all game long. At times it is much like being in the same section of the ballpark together. I told you earlier that I have never seen a Giants home game. That will change later this year. I've always been a misplaced Giants fan. Now I don't stand out as much anymore.